Nutritional Anomaly — Might Antinutrients Offer Some Benefits? You probably first heard the term “antinutrients” in a college nutrition course. You might have learned that these chemically active substances, often found in the leaves, roots, and seeds of a variety of edible plants, act in ways to combat plants’ nutrients, either by reducing their availability or otherwise adversely affecting them. Scientists identified antinutrients decades ago, discovering that some bind to nutrients, thereby preventing their digestion and utilization by the body, while other antinutrients appear to be toxic at high levels. What’s nature’s purpose for antinutrients? Scientists suspect that they help ensure the survival and propagation of a plant species. A. Venket Rao, PhD, professor emeritus from the department of nutritional sciences at the University of Toronto, who has studied compounds found in plant foods, believes plants synthesize antinutrients as a defense mechanism against insects, parasites, and other bacterial and fungal infestations. “For example, fruits contain seeds for the purpose of propagation of their species. However, if birds and animals were to eat the fruits containing the seeds and digest them to obtain additional nutrients and calories, then there will be no seeds left for the continuation of the plant species,” explains Rao. “So they make compounds that are so bitter that birds and animals discard them while consuming the fruits. Some of these compounds may also prevent the activity of the digestive enzymes, so that even if the seeds are consumed, they are excreted without altering their physiology.” Thus, antinutrients are part of a plant’s chemical defense system against invaders to ensure its survival. But when it comes to antinutrients’ role in human health, recent research suggests these substances may be getting a bad rap. Antinutrients exist in a wide range of plant foods, but they are found in particularly significant amounts in cereals and legumes, such as wheat and beans. Among the dozens of different antinutrients are enzyme inhibitors, flatus factors, saponins, and phytates. Consider phytates, which are found in grains—these antinutrients act to reduce the bioavailability of minerals and the digestibility of proteins and carbohydrates found in the grain. Rao reports that phytates can make the minerals calcium and zinc unavailable, resulting in the classical dwarf syndrome known in Egypt. In this country, people sometimes consume high levels of phytates in unleavened bread, which can lead to severe zinc deficiencies and growth impairment in children. But processing, such as the cooking, soaking, germination, and fermentation of particular plant foods, decreases the content of antinutrients such as phytates. Perhaps that’s why so many early cultures figured out they were better off soaking and cooking certain foods, such as grains and legumes, rather than eating them raw. Food scientists have known about the existence of many antinutrients, but they are just scratching the surface when it comes to understanding these substances’ overall function in human health. A new theory is beginning to emerge that suggests low levels of antinutrients may contain beneficial properties for the body. This shouldn’t come as a surprise since a body of evidence links the consumption of whole plant foods with a range of health benefits. Rao points to dietary fiber as a good example of how antinutrients may actually be beneficial. Long ago, there was no known nutritional role for dietary fiber. In fact, according to Rao, researchers believed that dietary fiber could bind to minerals and some other nutrients and make them unavailable. As a result, cereal-processing technology was developed in the late 1800s to remove or reduce dietary fiber from cereals and flours. Today, we know dietary fiber serves a very important role in human health. Fiber is now considered to play a role in preventing cancer, cardiovascular diseases, diabetes, and many other chronic human diseases. 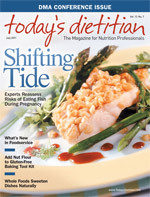 “So dietary fiber, once thought to be an antinutrient, is now considered beneficial,” says Rao. The viewpoint on antinutrients has changed to such an extent in the scientific community that Rao reports these substances are increasingly referred to as “biologically active compounds” in food. Scientists now have a fairly good understanding of antinutrients’ mechanisms of action, but more research is needed to better understand their role in human health. Ironically, some compounds on the list of antinutrients are now referred to as “nutraceuticals” or “functional foods” because of their demonstrated beneficial effects on human health. Perhaps in the near future, the chapter on antinutrients in nutrition textbooks will bear another name.